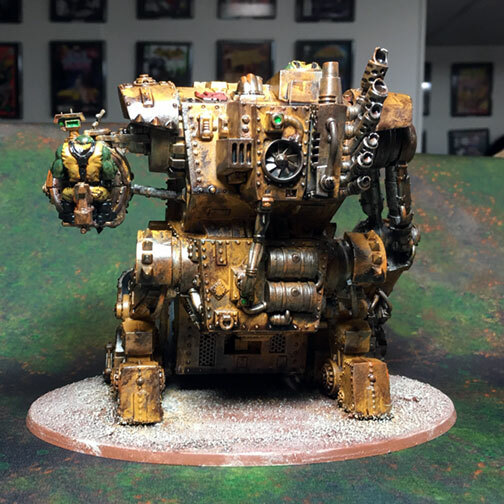 Warhammer 40,000 – Orks have always held a spot in my heart, the second blister I ever bought had the Blood Axe Ork Character in it and to this day I wish I had held onto it. It was such a cool model. Anyway the point of the bit of nostalgia is that I like orks, even though I’ve never played them as a full army. Horde armies don’t really appeal to me from a mechanical not visual standpoint. Unless you’re willing to put in to extra time converting each miniature with a horde you’re going to have a bunch of the same model. So while it’s not for me I do like orks from a narrative standpoint, they bring a bit of comedy to a grimdark universe even though the very idea of a horde of green monsters looking for nothing more than to destroy everything in their path is terrifying. 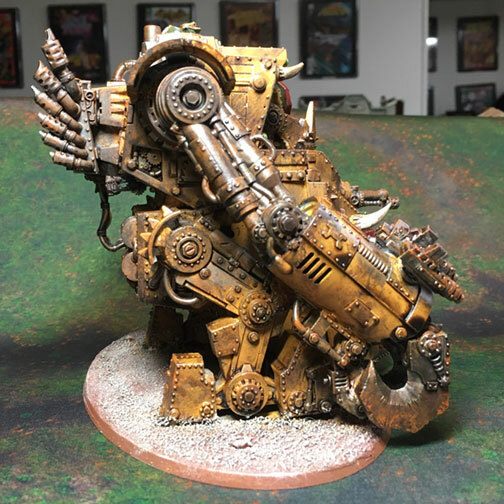 A new client of mine is looking to build an ork horde a little bit at a time. Which is great because painting a horde all in one go isn’t the most fun. To get me started he sent over some Burnas, a Warboss and a Morkanaught. He gave pretty generic direction so I went off the rails a bit with this batch. Using red, yellow an black as my base I then rusted everything up. The cars I did for Gaslands and the Necromunda terrain taught me some lessons about painting rust to look realistic and easy to paint. He did ask that the Warboss’s Squig be albino with a marine arm clutched in it’s jaws. Since this client and my current Deathwatch client play each other I thought I’d have some fun and make sure that arm matched the Deathwatch stuff I’ve painted.